Peaceful, relaxing and awesome scenery and wildlife. Our guide, Captain Tripp, was a wealth of knowledge and made the tour fun and interactive, encouraging us to explore and ask questions. We saw the lighthouse and explored the island, cruised the estuary and watched dolphins and pelicans and other birds. Small 28 ft boat. Take a jacket. Take your own water or snacks. Thanks Captain Tripp! We had captain trip, He was very informative and great even the kids loved him. He went out of his way to make sure the kids got to see dolphins. The only thing we didn’t enjoy so much was how windy it was other than that everything was perfect! Excellent tour - nearly private for our group of 5. My German cousins loved seeing so many dolphins at least 30 and all the wonderful water birds. Guide was well informed. Our guide, Captain Tripp, was fabulous. He was fun and knowledgeable. He obviously cares a great deal about the environment. Captain Luke was great! Very knowledgable. Boat ride to island was educationaland fun. Not much to do on the island though. It was great. The guide was very knowledgeable and informative. 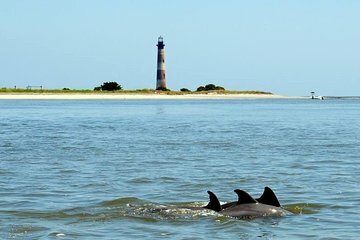 We were able to see dolphins and enjoyed walking the beach at Morris Island. Only downside was how fast we returned -it felt like we were late, and I thought this was a sunset tour and it turned out not to be. This was an amazing experience that I would highly recommend! Our tour guide, Trip was very informative and we learned so much. Morris Island is beautiful with lots of shells and is a must see!